Messy Play Parties - Any Day of the Week! I’m Alex, a qualified primary school teacher. I love being able to offer these multi-award-winning educational mark making classes to Bournemouth, Poole and Christchurch. My teaching specialism is in Early Years, and seeing children learn and have fun at the same time is something I love to see. Mark making supports skills needed for early writing, as well as having many other physical and emotional benefits. Children’s fine-motor skills and hand-eye coordination are nurtured (essential for writing). They also learn the 4 basic marks that underpin writing letters and numbers and drawing shapes. 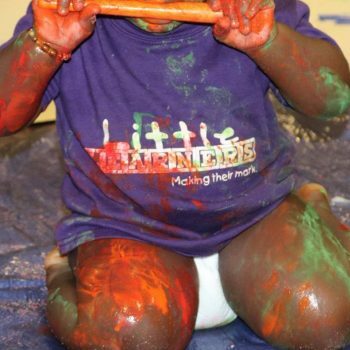 The sensory fun combined with learning pre-writing skills is what makes Little Learners so outstanding and unique. On top of this, your tots’ imaginative, creative and communication skills are developed. By making marks that are meaningful to them, children have access to a whole new way of expressing their thoughts and feelings without relying solely on verbal communication. 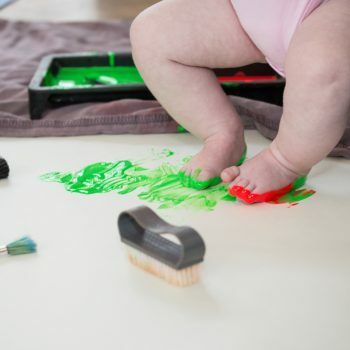 Mark making can also provide new insight for you into your child’s thoughts and feelings. Tools, materials and activities are differentiated so they are appropriate and fun for both your baby AND your pre-schooler. Siblings are HALF PRICE! How about something a bit different for your little one’s birthday, christening or any other celebration?! Did you know we can tailor our parties to your child’s interests or favourite characters? 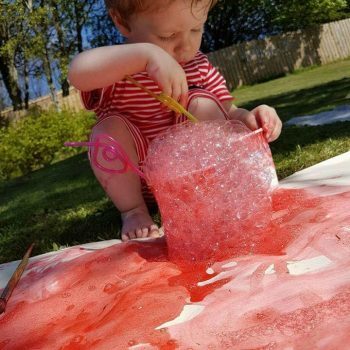 A ‘cake smash’ party is very popular and we can cater to themes such as Peppa Pig, Unicorns, football, Marvel Superheroes and many more. Alternatively, a ‘Super Messy’ includes all our class favourites. You can be as creative as you like or leave it all to us! The party room would typically be set up with a variety of themed messy and dry trays, sensory play, painting and drawing stations, play dough, crafts and a dance area. Our party package is £120 for up to 15 children and your party can be set up at a venue of your choice (including at your home, space permitting) – we bring everything required, deliver the session and clear up all the mess afterwards – what could be better? For an additional £20 we can provide a ‘cake smash’ tray and photograph it all for you too! Me and my daughter have been to the Little Learner sessions for 2 weeks now and both times we have both thoroughly enjoyed it. It is very relaxed, not overcrowded and Alex who runs it is fantastic with the children and making sure everyone feels welcome! I definitely recommend this class especially if your little ones like to get messy!! Rachael Ellis, mum to Hallie and a returning customer! My little boy loves these classes getting stuck in and super messy. Alex is very welcoming, knowledgable and friendly which really helps. Nicola Short, mum to Harrison and a returning customer! We really love ‘Messy Play’. It’s a controlled environment where the children can get all kinds of messy, whilst experimenting with different mark making and sensory experiences. And, you get to walk away from all the mess afterwards!  Water is provided at the end of each session so you can clean your little ones on site. Not only is this super helpful, we also use it as another play opportunity! Just remember a change of clothes and a towel! The other parents and children who attend are lovely, and Alex is great! Highly recommended!